Director of Olivovo center, musician and a teacher. Musician who is permanently involved not only by famous ensembles in the Czech Republic, but also in Germany and Switzerland. 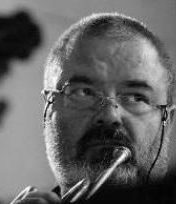 A musician who played in the Czech Republic with the leading ensembles of all types of music, from brass bands, rock opera (Jesus Christ Superstar), jazz, contemporary music, operetta and musicals (Karlin Musical Theatre), Opera (National Theatre), to symphonic music (Radio Symphonic Orchestra Prague). He graduated the Conservatory in Prague and the Faculty of Education, Charles Univesity. At present, a permanent member of the Akademie für Alte Music in Berlin and file Amphion Bläser Oktett in Basel. In 2006, he returned to his acting career in film Coming Soon, and in the same year, had a very successful debut as a director and with the world premiere of the opera “Esther de Racine ‘in Basel, Switzerland.